Cllr Paul Kane, Mayor of Kirklees, has met with the German Honorary Consul, Mr Mark Green, to reaffirm the twinning arrangements between Kirklees and the German district of Unna (a district similar to Kirklees and near Dortmund in Germany). Members of Dewsbury Dolphins Swimming Club and representatives from Greenhead College who have participated in German exchange visits were also at the meeting which took place on Thursday 10th September at Huddersfield Town Hall. Talks centered around how best to build links between the two places, which have been twinned since 1967. 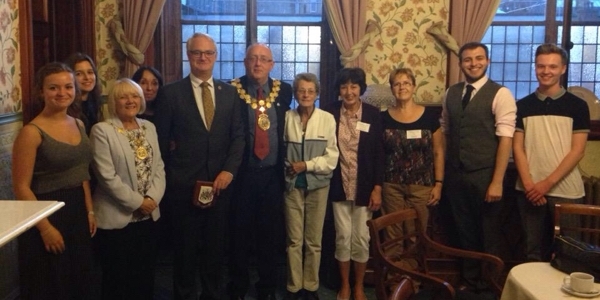 The Dewsbury Dolphins Swimming Club has been involved in twinning with Kreis Unna for over 30 years, with the Dolphins first visit to TuRa Bergkamen in 1983. It has then carried on with TuRa on every even year and Dolphins on the odd year to present day. Greenhead College have been exchanging with Ernst Barlach Gymnasium since 1993.